Maximizing Progress: MIT Energy Experiments ~ Campus as Living Lab! Interesting and yet somewhat dismaying example of using MIT's campus as a testbed -- a Living Lab -- for experimental interventions and explorations. 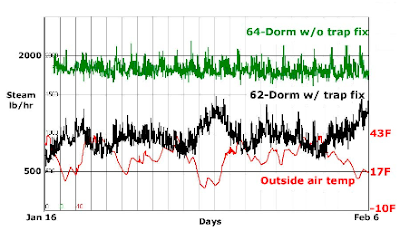 Rarely do you have a clear-cut controlled trial of comparables in energy efficiency, but the MIT East Campus parallel, equivalently symmetric dorm buildings were one such case. By fixing one set of "steam traps" while keeping the ill-maintained old group, we could see the performance advantages measured in steam consumption for a given temperature... This is trumpeted as a success-story, but, alas, the decisions which lead to decades of MIT deferred maintenance -- and consequent operational cost-waste -- have not been punished or recovered.